The Real Estate Market in The Villages is a little different than most areas. The Villages developer up until 2004 had two Real Estate brokerages that competed with the local brokerages. In October of 2004, the developer decided that they would close their brokerages and create The Properties of The Villages, an in house home grown listing service. This service would not share any commissions with REALTORS or any others, and would only work with their sales representatives. Yes, same homes side by side listed by the developer and REALTORS at competitive sales commissions. So, NOW for you to see ALL the pre-owned homes you now must work with a MLS Florida REALTOR and a Villages Sales Representative, and of course For Sale By Owners. PLEASE note that The Villages Sales representatives / Developer do not represent the SELLER or the BUYER in any transactions. For the largest listing of Homes for Sale or Rent in The Villages Florida visit this website. The Villages is located in central Florida and is in THREE counties. Lake, Marion and Sumter. The majority of homes are in Sumter County and this is where new homes are now being built. Build out is based on the number of homes built. There are 6 types of homes in The Villages. When The Villages originally began it was a section of Manufactured homes in Lake County. These homes are located across from Spanish Spring Towne Square east of US Hwy 441. Many of these original homes are still occupied with some newer mobile and site built. 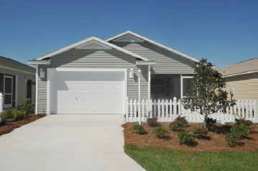 Site Built homes started in the early 1990’s and began in Lake county, then Sumter county and then Marion County and then back to Sumter county. There were and still are 5 types of homes. Patio Villas, Courtyard Villas, Cottage/Ranch Homes, Designer Homes, and Premier Homes. The majority of these homes have 2 baths with a shower in the Master Bath and a tub in the guest bathroom. A few of the larger designer and premier homes may have a garden tub also. These homes are grouped together in each Village. There are a few 1 bedroom models, but mainly 2 bedroom 2 bath single family homes. There are currently 14 models with the majority of the homes 2 bedroom and a small percentage of 3 bedrooms. They all have two baths. Courtyard Villas have a wall around the property (4 walls), except for golf course views and conservation areas (have 3 walls). 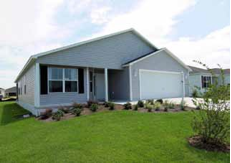 Two and three bedroom two bath frame homes on interior, corner and Cul de sac lots. They are like all of the other homes are built in sections within a Village. Designer homes are both 2 and 3 bedroom homes. The vast majority of the homes are 2 bedroom with a den, but are advertised as 3 bedroom with disclaimer in the description. There are only a handful of models that have 2 ½ or 3 baths. Premier homes have much larger lots and represent a very small percentage of the homes in The Villages.